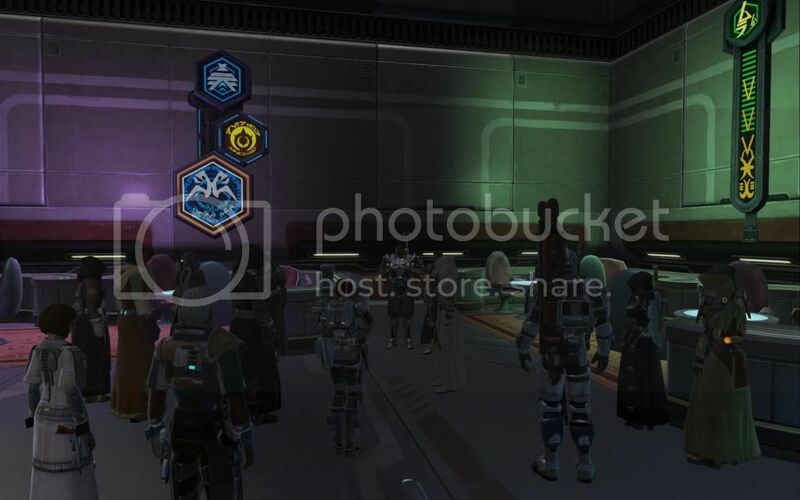 The Kaas Imperial Legion is a SW:TOR heavy Role Playing guild located on The Ebon Hawk Server that is focused on providing a mature story driven environment for our members with friendly teammates. We also provide social-leveling; and a medium focus on PvP and raiding. Our goal is to create a respectful, positive, and relaxed OOC atmosphere while maintaining a mature, compelling, and immersive IC element for the guild and our roleplay server at large. Quality roleplay, fun weekly events, and a laid back approach to enjoying your gaming time sets us apart from many others. All alignments are encouraged to join. It's also an important point and principle of the guild to welcome people of all backgrounds, sexualities, and beliefs. Our real life differences all can be set aside as we enjoy the same game. So as we know, SWTOR went free-to-play recently, but what does that mean...if anything at all? Well, it definitely opens the door for those who did not play the game or left the game due to the subscription model to come right on back into it all. It also means that there's a wealth of new players and thus roleplayers to create a new influx of creativity and community. What does that have to do with the remnants of TCV? Well, just from looking at the site, certainly the TCV is no longer what it once was. Leadership changed. The guild merged. Yet, still I see people checking in and posting or commenting or just saying hi to stay in contact every now and again. Despite the guild not remaining in essence, the spirit of community and friendship still ties many of us together. So we can draw on that and we should. I definitely will be coming back into the game and some are already there or on the brink of jumping back into the f2p world, even if it might not improve the gameplay exactly haha. Yet, that said what does it mean for how things will go? Well my general idea is this, since some have asked if I'd lead again I'm thinking I can do that, I do love what we made here and I don't want to see it go to waste. Maybe we can start up on the Empire side if the majority want that, since it did have the better story and we've already seen so much of the Republic quest-lines that it'd be old hat. Here's our chance to have a new guild with a new fresh start and feel...and maybe even have a new rank system, etc. to add with people we know so even though it's different it won't be too weird as we're not all strangers like when the guild originally started haha. Guess we'll see what the name could be and how it'll work, but at least getting enough "Yay's!" vs. "Nay's" it's the start to getting the ball rolling on so much more. The Coruscant Vanguard is moving! I'd like to thank Shien for being a wonderful home in its time. It was an exceptional choice for me, and I hope you all will agree, whether you followed Aiden here from before launch, joined a friend, or - like me - if you randomly chose it out of the available RP servers. I know I certainly am not regretting where Lady Luck had me cast my lot. Looking forward, I am hoping that a robust new population will make organization and participation in events and gameplay that much easier. For more information on the move, please check the forum post that will detail my thought process as well as instruct you how to proceed. The Vanguard will remain on Shien for anyone wishing to stay behind, though not in any in-character fashion. As far as the move goes ICly, there's no logical reason to assume anything has changed - in fact, the server itself is a completely beyond-the-fourth-wall concept, and should be treated with IC ignorance. Thanks for your understanding and patience, everyone. If you can contact someone outside of the game who is not currently playing, please do so to give them an idea of what is happening, and point them here. As everyone should know by now Aiden, our fearless leader, mentor and friend, has stepped down. He encouraged us all to become better people and to treat everyone, guildies or otherwise, with Respect. Aiden, on behalf of The Coruscant Vanguard, be safe, have fun and keep in touch. We will miss you! In a related note: Jetalon has been overwhelmingly picked by his peers and friends to take up the mantle as the guild leader for The Coruscant Vanguard. He has some big shoes to fill but we can all rest assured that he will lead us into the future wisely and do us proud! We are opening up a new chapter in our story for The Coruscant Vanguard. By following the three tenets of Respect, Unity and Diplomacy we will persevere and prosper. For the Vanguard!